Find out exactly how much fun that Google Assistant Mad Libs app is. Beyond automating your home through Routines and sending money to a friend, the capabilities of Google Assistant are expanding rapidly. So you don't waste time trying out lousy features, Google is letting users now post reviews on Assistant apps and integrations to help others determine the usefulness of each, according to Android Police. For now, at least, you can only view or leave reviews using an Android device, and they aren't visible on the Google Assistant iOS app or web directory. 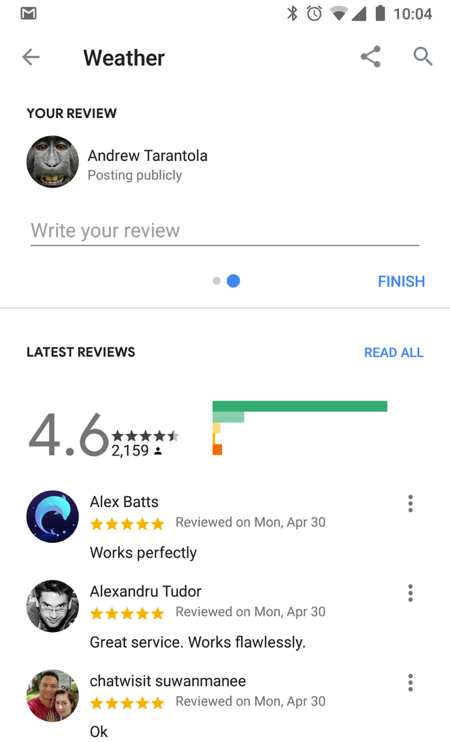 Reviews are currently displayed chronologically, and there's no way to see which ones are the most helpful — something you can see on Google Play app reviews. While this reviews program isn't fully fleshed out yet, adding them is a logical move. Helping others gain a sense of how well a Google Assistant integration works (or flagging their quirks or drawbacks) should help users get the most out of the voice assistant and avoid pitfalls. If, say, you have a smart home app that isn't responding correctly, it'd be helpful for others to be aware of a potential bug. Reviews will aid developers in figuring out what's working or not beyond their data dashboards too, so it should help everyone in the long run.